Riverside Cottage in Low Nibthwaite, near Ulverston, Cumbria sleeps 5 people. Riverside Cottage near Ulverston is a mid-terraced Cumbrian cottage, nestled in an enviable, quiet and rural location within the hamlet of Low Nibthwaite. Originally part of the local sawmill which dates back to the 1700s, it is set in a large mature garden, with shrubs, lawns and seating areas. The River Crake is at the bottom of the property and you can enjoy private fishing rights in this river from anywhere along the boundary of Riverside Cottage. There are excellent walking and mountain biking trails from the doorstep around the shores of Coniston Water and surrounding fells. The large open garage is ideal for storing your sporting equipment, and there is parking for up to three cars. 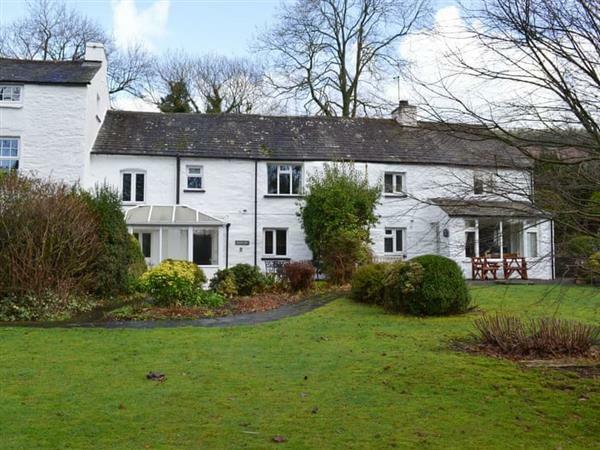 This is the ideal holiday home to use as a spring board for the visiting Lake District National Park. The beach is 10 miles from Riverside Cottage near Ulverston. With the shop 4 miles, and the pub & restaurant are 1 mile from Riverside Cottage. Kitchen/dining room: With electric oven, electric hob, microwave, fridge, freezer, washer/dryer and beams. Economy 7 heating, electricity, bed linen, towels and Wi-Fi included. Welcome pack. Large lawned garden, patio with garden furniture and barbeque. Course fishing on-site. Private parking for 3 cars. No smoking. Please note: There is an unfenced river in the garden, 100 yards away. Holidays at Riverside Cottage run from Friday to Friday. Pets allowed at Riverside Cottage. For a better idea of where Riverside Cottage is, you can see Riverside Cottage on the map below. Riverside Cottage is in Derbyshire; should you be on the lookout for a special offer, you can find all the special offers in Derbyshire. It's always worth checking to see what is on offer at the moment. Do you want to holiday near Riverside Cottage (UK1367), you can see other cottages within 25 miles of Riverside Cottage; have a look to find your perfect holiday location.